Tales From the WagginMaster has been silent since April 2016. I guess you could say I’ve been in a funk. Not necessarily in a state of depression, but just plain old ho hum funk. The other day, my youngest daughter ask me why I had not posted in a while. I used the lame excuse, “no topic”. She replied, “Well, just write about what God is teaching you. That got the gears in motion. After giving her comment some serious thought, I’ve decided it is time to go public with what God has been teaching me. Some may see that as a means of becoming vulnerable. I see this as a means of sharing good news. But first, I must digress and fill in the gap between April 2016 and now. In my previous post, I reported that I hit the ground running. I can say that I did not stop until mid October when I began to wind down my projects and prepare for our journey to West Virginia for the winter. More on that in a bit. In Manchester, TN I worked as the park’s Handyman. That suited me well since I love to work on projects, large and small. I had full control of my time meaning that I did not have set hours. I did my best to get my weekly activities completed in 4 days so I could enjoy a three-day weekend with Carol. Carol had an accident in May where Cody (our beloved Golden Retrieve) unintentionally pulled her off the landing at our RV. She fell about 3 feet onto our concrete patio and fractured her right wrist and was bruised pretty badly. (I’ll spare you the photos.) She was out of work for about a week but bounced back just fine. I worked after-hours on a few projects so I would not disrupt customer activities in the registration office or store. Largest project was a complete renovation of a one bedroom apartment above registration. I had great helpers along the way who made my work go quickly. About mid summer, we began searching for a winter position. We found several spots and talked to many park managers only to find nothing felt right. In God’s time, He led is to a conversation with Fox Fire KOA in Milton, WV. Carol and I agreed this was the place for us so we began making preparations for relocation. We had to leave Manchester a week earlier than planned but that also worked out well. We did make a commitment to return to Manchester, TN for our summer 2017 spot and are looking forward to returning. Before we left Manchester, TN. 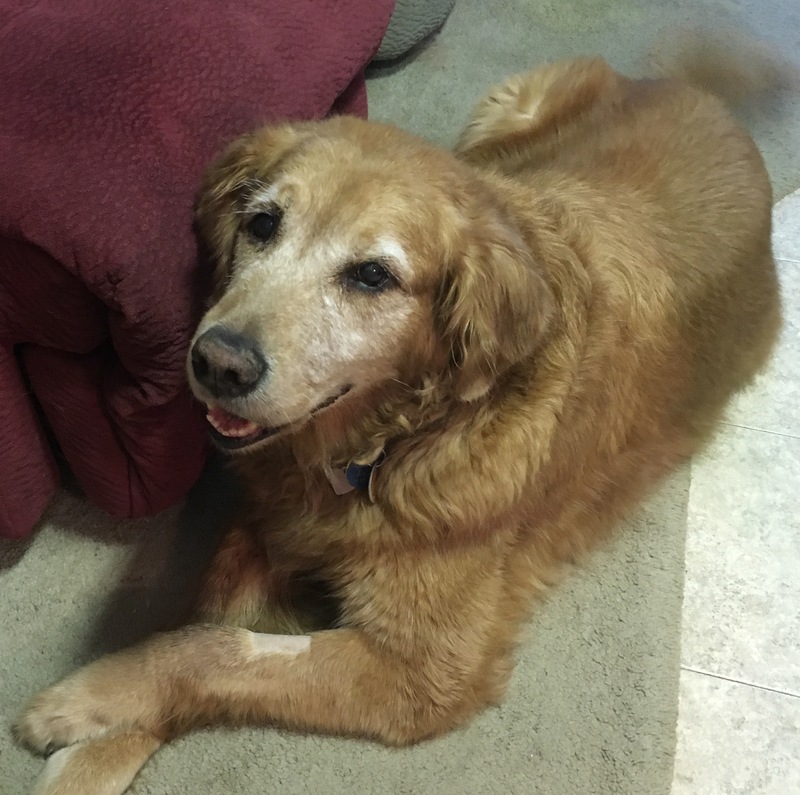 Cody (our Golden Retriever of 12 years) developed congestive heart failure. On Wednesday,October 5th we took Cody to the vet for the last time. He was met at the rainbow bridge by many of our former fur babies. His final resting spot is on the property of Manchester KOA where the owner and his son dug Cody’s grave while we were at the vet. A couple of weeks later, Carol and I visited PAWS of Murfreesboro and fell in love with Chessa. 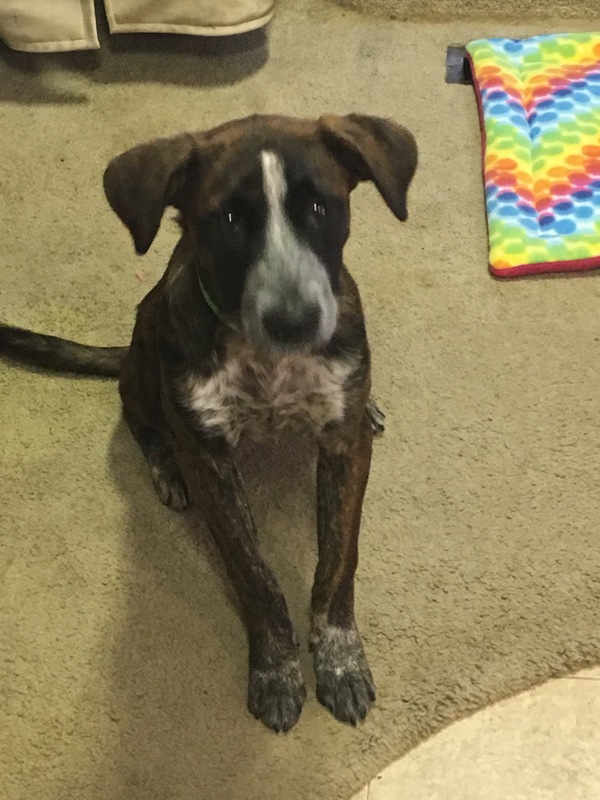 She is German Shorthaired Pointer mix and a puppy. Yes, a puppy. She is now about 7 months and is supper smart. She is house broken, loves her crate, and loves daily walks and play time with me. It has taken about 6 weeks for MeiLing (our Chinese Crested) and Chessa to figure out each other. We still miss Cody dearly but know he is no longer suffering as he had been. There will always be room in our hearts and home for fur babies. After a short 400 mile drive, we arrived at Fox Fire KOA in Milton, WV the week before Halloween weekend. We stayed in this park in the spring when we traveled from Shenandoah Valley KOA in Virginia to Manchester KOA. It did not take us long to get settled and into a work groove. Carol and I work Thursday-Saturday from 9-6 and every other Sunday from 1-6. We leave here at the end of March and plan to visit the Corvette assembly plant in Bowling Green, KY on our way back to Manchester. Ever since our work time in Amarillo, TX (winter 2014/2015), God has led us a great worship spots. In Amarillo, it was St. Stephen Church. In Virginia, it was Grace Covenant Church. In Manchester, it was Christian Life Church. And here in West Virginia, it is New Life Church. Plus Carol and I have enjoyed participating Bible Study Fellowship’s study of Revelation and The Gospel of John. I am also working through some online Bible study courses from Dallas Theological Seminary. Now, what has God been teaching me? For that you will need to check back for the next post. If you want a clue, take some time to meditate on this passage of scripture. Think about why God sent His Son, Jesus, to the world. This entry was posted in Tennessee, Travel, Virginia and tagged Chessa, Cody, KOA, MeiLing. Bookmark the permalink. I was worried about you! I am so glad you are back. And share away…what God has shared, what nature has shared, what life has shared…we are here for you. It’s so good to see you back! So sorry about all the mishaps in your and Carole’s lifes, but God is leading you in the right direction. Keep listening and keep us posted! Nice to hear from you Jerry and sorry to hear about the loss of Cody and Carol’s wrist. Hope that new little puppy is keeping you on your toes and smiling. Glad that you’re back. I know how hard it is to keep a blog up to day. Enjoy hearing from you. Looking forward for reading your next post. Pray that you and Carol have a Merry Christmas and Happy New Year. God Bless you and Carol in the coming year. So sorry about Cody but so wonderful to bring a new dog who needed a home into yours. I hope things continue to look up for you!